The results are reported today, 25th November 2015, in the journal Smart Materials and Structures. "Imagine a world where you drop something, and it bounces back without any damage" says Daniel Xu, an author of the paper. "That's the benefit of these rubber devices that can flex and stretch." The keyboard was made from a single laminated structure with two sensing layers oriented at 90 degrees apart. This took advantage of their mechanical coupling while at the same time still provided an electrical separation. A total of nine different positions were distinguished within the sensor keyboard. "A key benefit of our keyboard is that essentially, it's just a thin sheet of rubber. It can be wrapped around any object which turns it into a keyboard." Continues Xu. "It can also be made into a sensing skin for motion capture, which is useful for athletes, clinicians, and for new interactive gesture controllers." The researchers often used video games to test the functionality of the keyboard - and as part of a separate project have made a sensing glove to interface with shooting games. 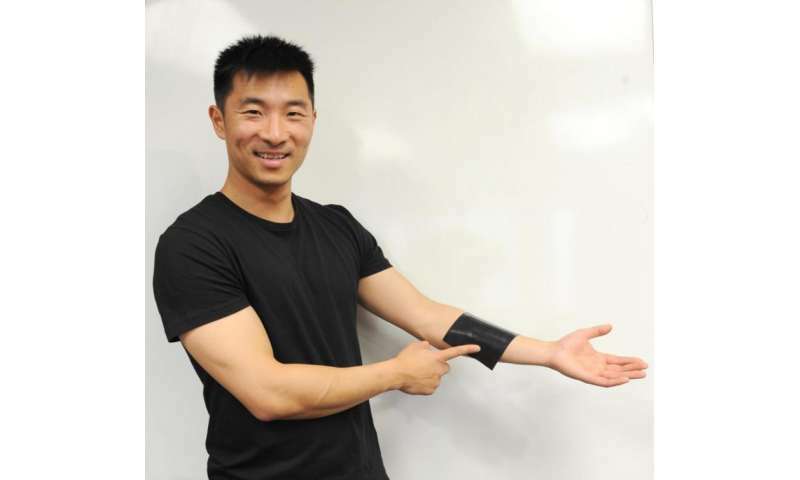 Work is now taking place with a spin-off company, StretchSense, to develop wearable and other technologies designed to sense stretch. The researchers at Biomimetics Lab at the University of Auckland seek inspiration from nature to find creative solutions to engineering problems, and are world leaders in soft sensor research, energy harvesters and human powered submarines.